We became involved in the design of Sean’s Park during the Recession. At that time fundraising for any cause was challenging and the execution of the project had to be postponed. The delay gave us plenty of time to research the most innovative concepts and ideas to be presented to trustee Mike Morrissey. Our inspiration for the project was Mike’s son, Sean, an aspiring artist, who spends most of his time in the fine arts studio. We were driven to create a park that would be comforting to all those with disabilities and trigger their creativity at the same time. The Project eventually came out to public bid in 2014, and after putting together the best team consisting of Southwick Landscape Architects, Roche Constructors, JMA Architects and XL Landscape Development, we were appointed to produce the playground equipment including musical instruments, learning garden bed boxes, metal ramadas, fabric sail shades, site furnishings, safety surfacing and to install a drop shot court. Together we built a dream-come-true project for the Morissey family and many others to enjoy. 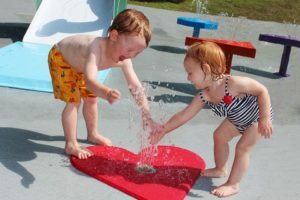 This Park has all the pertinent elements that would be a dream for ALL parks to have: the Inclusive Play design and creative content allows socialization, swinging, spinning, sounds and lights, sliding, sensory stimulation, accessibility and safety.